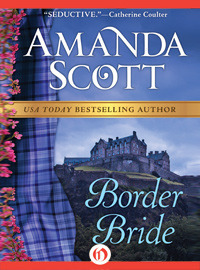 Amanda Scott's amazing talent for historical detail takes a backseat to the feisty Mary Kate MacPherson, heroine extraordinaire in "Border Bride". Forced into marriage by her father, to the handsome and powerful, yet roguish knight, Sir Adam Douglas. Mary Kate has no choice but to seek her fortunes in the borderland of Tornary. It appears however, that in choosing Mary Kate, our dear Sir Knight may have bitten off more than he can ever hope to chew. For in a time when women are to be seen and not heard, and may find themselves whipped at their husband's slightest vexation; Kate is determined to be both heard and seen on her own terms. This book is all about Mary Kate, and in this case her sense of fire and spirit make her interesting enough in word and deed to carry the story and readers' hearts. 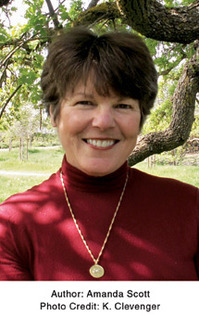 Mary Kate's "never let them see you sweat" attitude and quick mind, keeps readers wondering what she will do or say next, and just what delicious sort of trouble it will lead to. All other characters seem mousy (in the case of the women) or stuffy and overbearing (in the case of the men) in comparison to her. The only character that comes close to our heroine in terms of level of interest is Sir Douglas, and that is only after he stops trying to bully Mary Kate. 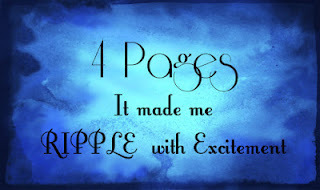 The story is well paced and never drags. The plot contains elements of intrigue and levity along with the history and romance. This is a very easy read, that though historical is never boring. The only negative of this read is the open-ended finish. It seem as if there was a bit of a rush there and the end seems not to be as polished as the rest of the book. This flaw is all that stands in the way of 5 stars. This is a wonderful book, and I am happy to say that there are more in the series.